What is up with those Swedes and Crayfish? Beel used Google Insights for Search to examine searches for crayfish (kräftor) in Swedish. Let Beel present the results: the volume of searches is very seasonal. There are few searches until late summer, searches then increase sharply in early fall, and decline in late fall. So, what is up with that? In Sweden there is a short, crayfish season that begins in late summer. Crayfish are collected (or purchased) and eaten as part of a kräftskiva, a crayfish party, at which is served cooked crayfish and akavit. This must be quite fun: the volume of searches varies with season, as might be expected, but peak volume, and interest in kräftor, is remarkably constant from year to year. Beel thinks this looks great! But don’t forget the akavit. (Source of photo: http://en.wikipedia.org/wiki/crayfish_party). The history of crayfish in Sweden is most unfortunate. 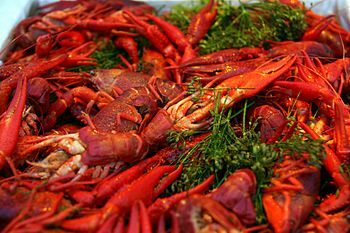 It appears crayfish first were consumed in Sweden in the 16th century by royalty. The practice of eating crayfish eventually spread to the general populace and by the mid-19th century crayfish were a popular food. Originally a single species, the noble crayfish Astacus astacus, was native to Sweden. The common name was in reference to the belief that it was the finest tasting crayfish in the world. In the mid- to late-1800’s, crayfish plague, a lethal fungal disease Aphanomyces astaci astaci, was introduced into Europe. The means of introduction is not definatively known, but many persons attribute this introduction to the release of ballast water from an a North American ship. The plague spread to Sweden by the early 20th century, where it devastated populations of noble crayfish. Because of the decline in populations of the noble crayfish, signal crayfish Pacifastacus leniusculus leniusculus was introduced into Sweden, from North American, as a replacement. Signal crayfish is more resistant to the plague than is the noble crayfish. Signal crayfish flourished in Sweden and, because it was resistant to the plague, contributed to the further spread of the disease. The noble crayfish is now listed as critically endangered in Sweden. So, Beel says, “Eat up!” Help the noble crayfish by removing its introduced competitor. This entry was posted on January 18, 2012 by denstormer in Google Stuff and tagged Europe, fish festival, Google Insights for Search.